Jared Unzipped: Potential Mass Shooting Averted at 2015 Pokémon World Championships. Potential Mass Shooting Averted at 2015 Pokémon World Championships. Boston Police provided this photo of the weapons, ammunition and personal items found in possession of Norton and Stumbo, the accused attackers at the 2015 Pokémon World Championships. A lot of nerds take their various hobbies and interests way too seriously. Dressing up in fur suits, getting My Little Pony tattoos, standing in line for hours to obtain free comic books... the list goes on an on. But these two geeks? They take the cake. Two morons from Iowa were arrested on Saturday at the 2015 Pokémon World Championships in Boston, Massachusetts. Before arriving at the tournament, Kevin Norton (18) and James Stumbo (27) allegedly made threatening comments to other tournament attendees via their social media accounts. They also shared photos of various guns with those remarks. These threats were then provided to security officials at the convention center where the event was being held. Within hours, the pair of Pokémaniacs were in custody. 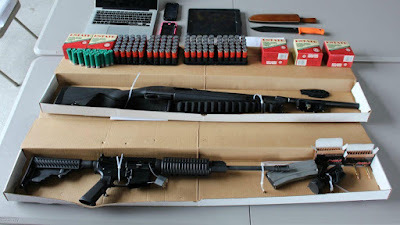 They were found to be in possession of a 12-gauge shotgun, an AR-15 rifle, several hundred rounds of ammunition and a hunting knife. Thankfully, the duo was apprehended before they could sneak the weapons into the event. The terrifying part? Norton and Stumbo were both official attendees of the tournament. They were to take part in the Masters Division and were invited to participate in the tournament by its organizers. This was clearly not a case of two strangers raiding an event -- they had the proper credentials to be there. If not for the convention center officials being tipped off, this could have gone horribly wrong. I've played video games in the Pokémon series for as long as it has been in existence -- since 1998 to be exact. In that near twenty-year time span, not once have I ever taken the games this serious. Sadly, this is yet another example of socially-inept geeks not understanding how to process reality, nor communicate with other humans beings. We've made it too easy for such people to exist in modern society.